Uzbekistan: The world's strangest land grab? Built in 2007 about 3km from the Amu Darya - which runs along the border between the two central Asian giants - the school was financed through the National Solidarity Programme - a development scheme largely funded by the World Bank. Yet all that remains of that investment is a solitary wall, dangling tentatively over a precipice. Sitting in its shadow, two teens stare blankly across the vast river that is rapidly swallowing their homeland. 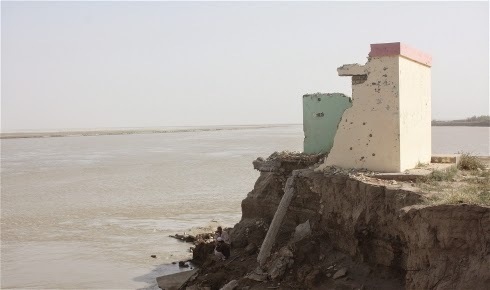 Every year for the past decade the Amu Darya has encroached up to 500 metres further into Afghanistan, taking with it large swathes of territory and leaving hundreds of families homeless. And as the official border between the countries is defined as the middle of the river, Uzbekistan has laid claim to hundreds of kilometres of Afghan territory. Arigh Ayagh housed 200 boys, but they now share a venue with the local girls school. That school itself - home to 500 girls, as well as their displaced male counterparts - is only a few metres from the still eroding riverbank. The cause for the lost homes appears to be a mixture of climatic changes and one of the world's most underreported cold wars. Fifty years ago the river in that area was about 1km wide, says Abdul Basir Barak, programme coordinator for local NGO Organization of Human Welfare. In the past 20 years, he adds, it has exploded - now measuring over 10km at some points. "If you use Google Maps, then look at our maps from a few years ago, you can see how fast it has grown," he said. Yet the river has not merely expanded, it has shifted course. Andrew Scanlon, country programme manager of the UN Environmental Programme (UNEP) in Afghanistan, explained that rivers naturally seek to meander - to change course over many years. "The Amu Darya was initially impounded in the 1940s and 1950s, for irrigation purposes, but this is not a practical long term strategy for flood protection, due to this meandering," he said. Politics is affecting how the river is shifting. The Uzbeks and the Afghans have had tense and sometimes hostile relations since the 1970s, partly because the militant group the Islamic Movement of Uzbekistan has a support base in northern Afghanistan. For that reason the Uzbeks have sought to seal off the border - starting with the river. While some trade is allowed, on the Uzbek side barbed wire and electric fences stretch the entire 210km border, making it among the most heavily guarded in the world. The ironically named Afghanistan-Uzbekistan Friendship Bridge is the only formal way to cross. These hostilities have also affected the flow of the river. Since before the fall of the Soviet Union in the early 1990s the Uzbeks have also sought to fortify their border from erosion, installing concrete protection walls in the riverbed. The Afghans, in contrast, have done virtually nothing to protect their banks, where the soil is thin and easily washed away. By fortifying their own banks, the Uzbeks have inadvertently ensured that any erosion must take place on the Afghan side, while also making the river run faster. The result: The river has both grown in size and gradually tilted into Afghan territory. Scanlon explained: "It can be compared to a large funnel leading into a pipe. If you have a lot more water going into the funnel, then through the pipe, then it speeds up and exits the pipe at the bottom at vastly increased force and carrying [a lot] of sediment, pebbles, and boulders. With a long river meandering, river forces are sideways as well, so flooding is natural," he said. "However if you only build engineering structures such as side protection walls on a river, you force the river to speed up, causing more damage downstream. This is not good river management." The Afghans even accuse the Uzbeks of direct interference. Barak explains that they hear regular tales of ships allegedly digging up the sand to divert the flow of the river, or even Uzbek forces deliberately destroying the Afghan riverbanks in the dead of night. He added that they could not independently verify these claims. The Uzbek government did not immediately respond to requests for comment. From the Afghan side of the river, you can just make out the rows of fortifications on the other side. In the face of such a daunting prospect, Mirwais Hatak, the local district governor, appears to have channelled King Canute's much-quoted command to the waves to turn back. Squinting into the sun, he points a kilometre upstream to where the river is narrowest. "The water is only two metres deep there. If they close it there and put a dam, we will have no problems here," he said optimistically. Like Canute, it seems his attempt to turn the tide is unlikely to lead to anything but wet feet. Other more practical solutions have also been suggested. International NGO Action Aid has been trying to establish an early warning system that would help the residents prepare for their displacement. Likewise they have started experimenting with biodykes - small barriers, often made with sand-filled bags that, due to their bioengineering, protect the riverbank from erosion. Such projects have succeeded in Nepal but ActionAid admits that so far all their attempts have failed, with their lack of access to the base of the river often impeding their work. Hatak adds that the Afghan government has spent many millions trying to stop the erosion to no avail. The Afghan government and international donors should, experts agree, seek longer-term solutions. Georg Petersen, an Afghanistan expert with the HYDROC consultancy firm, said far more investment was needed if the Afghans wanted to hem in the river. "Successful civil engineering structures can be designed but from what I have seen so far in Afghanistan they are prone to a high failure rate," he said. "This is because implementation is often done to a very poor standard as a result of the unavailability of proper construction equipment." He added that attempting to keep the river exactly where it is would be battling against its natural flow. More "holistic approaches", including sustainable catchment management, should be pursued to keep the water flow gentle, he added. Barak is looking to the new Afghan unity government to push for new agreements on river management with the Uzbeks. "Without that," he said, "it will continue destroying large amounts of land and thousands more will be displaced." Back on the riverbank, three young boys who attended Arigh Ayagh School watch as the adults discuss what can be done to save their temporary education centre. What will they do if their new school disappears, they are asked. Shrugs. Yet more victims of perhaps the world's strangest land grab.